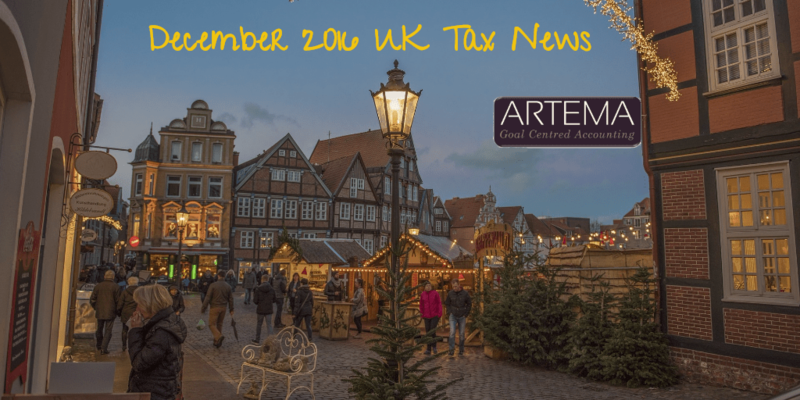 Welcome to Artema’s December 2016 UK Tax Newsletter. Where additional tax is payable as the result of an HMRC enquiry and it is shown that the additional tax is due to poor accounting records, the maximum penalty that can be imposed is 30% of the additional tax for failure to take reasonable care. Where the error is deliberate, the penalty will be between 20% and 70% of the extra tax due, rising to 100% where the matter is deliberate and concealed by the taxpayer. We can negotiate lower penalties on your behalf as the penalty can usually be reduced if we tell HMRC about the error. HMRC may make further reductions depending on the quality of the disclosure and if we help HMRC work out what extra tax is due. Individuals who are domiciled in the UK are subject to inheritance tax (IHT) on their worldwide assets wherever situated. Non-UK domiciled individuals are currently only subject to IHT on their UK assets. Classic planning for non-doms was to hold UK assets, particularly UK houses, through an offshore trust or company. The consultation on proposed changes suggests that such a structure will be ineffective in future with the underlying UK house being chargeable to IHT. Currently the business premises renovation allowance provides 100% tax relief for the cost of renovating a commercial property located in one of the 2,000 or so designated disadvantaged areas, provided it has been out of commercial use for at least 12 months. The premises should then be brought back into commercial usage or rented out to a business to use within its trade or profession. Unfortunately this generous tax break is due to end in April 2017 so get in quick if you are considering renovating such a property. It may be an office block, factory or warehouse that you already own or a property on the market that has been out of use for at least 12 months. Typical qualifying costs would include building works, architectural and design services, survey and engineering costs, planning application costs and other statutory fees. The works must now be completed within 36 months of the expenditure being incurred as many renovation projects involved the payment of certain costs in advance. Where an individual is resident but not domiciled in the UK there are special rules that apply to that person’s overseas income and capital gains. Plus only their UK assets are charged to inheritance tax. The government has been consulting this summer on possible changes to the rules from 6 April 2017.
was born in the UK and has a UK domicile of origin. The individual must also be UK resident in the tax year under consideration. must have been UK resident for tax in at least 15 out of the 20 years preceding the tax year under consideration. Currently 100% capital allowances are available when a business buys a motor car with CO2 emissions of no more than 75 grams per kilometer. Legislation has now been passed to reduce the threshold to just 50 grams from April 2018 but also to continue the tax relief for 3 years until 2021. Normally motor cars only receive a writing down allowance at the rate of 18% or 8% on a reducing balance basis, which means it can take several years to get tax relief for the cost of the vehicle. The cost of a low CO2 car can therefore be immediately written off against business profits. There will be no change in tax treatment for individuals or partnerships already operating as property dealers or developers. However, it is felt that those buy-to-let investors who acquired a property with a view to ultimately selling on at a profit may be brought within the scope of the new rules by condition (1).